ASU researchers build their own "patch of asteroid" inside of a small spinning satellite seen here in this artist rendering. A dozen astronauts have walked on the moon, and several rovers have been piloted on Mars, giving us a good understanding of these off-world environments. But when it comes to asteroids, scientists enter uncharted territory. Landing on an asteroid is notoriously difficult. Asteroids have very little gravity because they have very little mass. Most of them appear to be rubble piles held together loosely, with surfaces covered in boulders and gravels and fine materials, much like the moon, but with a lot more cohesion. On an asteroid, a rock the size of a bank building weighs as much as a cricket on Earth, making an astronaut like a superman. But what would you anchor to, what you would land on and how would you move around? Because scientists and engineers don’t know the most basic mechanical properties of an asteroid, sending a billion dollar landing mission to an asteroid is risky, and even likely to fail, until some preliminary investigations are conducted, requiring years of lead time. 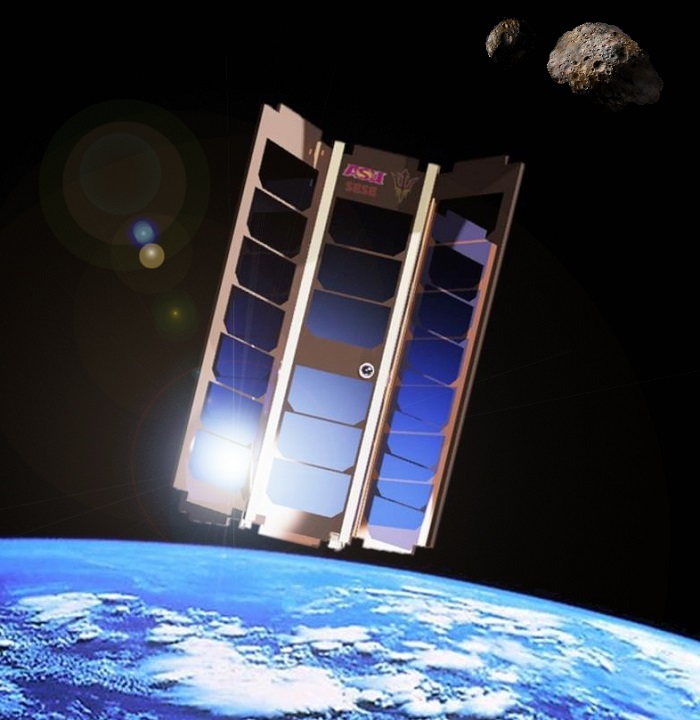 A team at Arizona State University is looking to mitigate that risk and improve that schedule by building its own "patch of asteroid" inside of a small, spinning satellite costing less than $100,000. The project is called the Asteroid Origins Satellite, or AOSAT I. “Landing on asteroids is one of the biggest challenges of our time,” roboticist Jekan Thanga said. Erik Asphaug, a planetary scientist and professor at ASU, is the science principal investigator for AOSAT I. He and Thanga plan on launching a miniature satellite later this year that will serve as the world’s first CubeSat microgravity laboratory. A CubeSat is a modular small satellite with a 10-by-10 centimeter base and various unit lengths. AOSAT I will be a 3U configuration, about the size of a loaf of bread, with two spun-up laboratories in the outer units, each housing a patch of real asteroid surface material. In the first flight, one chamber will be filled to a depth of a few centimeters with very fine material representative of interstellar dust, or the fine "ponds" seen on several asteroids. The second chamber, otherwise identical, will be filled with bits of shock-fragmented chondrite meteorite material. Once launched into space and freely orbiting, these rocks will just tumble around – itself an interesting experiment. But to build a realistic regolith surface for scientists to explore, the satellite is spun, to create microgravity-like conditions. To simulate the gravity field of a 300-meter-diameter asteroid, AOSAT I spins once every 4.5 minutes. It can spin faster to reproduce the regolith (surface material) conditions for much larger asteroids. This spin configuration is easily attained and stabilized by off-the-shelf approaches, making it a great approach for students to learn on. While much of the CubeSat is off-the-shelf, the approach is novel. CubeSats have typically been used to test engineering designs in space, since it is a really constrained and relatively new form factor. Great science has been performed on CubeSats, although this has only been observational so far. CubeSats have not yet been used to do “test tube and beaker-type” experiments of the sort that are planned for AOSAT I, Thanga said. Experiments will be conducted robotically in the end chambers. When AOSAT I is not spinning, it is a zero-gravity capsule. Here, experiments will be done to understand how dust clumps together to form asteroids – a process that plays out in zero gravity over long timescales. A simple robotic plunger is being designed to interact with the patch of regolith, and can be used to accrete a globule of particles, a miniature rubble pile asteroid that can be spun and shaken, observed by stereo cameras. When AOSAT I starts to spin, these piles of grains will get accelerated to the outer walls. Observing that process will tell us much about nebular grain behavior and microgravity particle flows on asteroids, for example, following the formation of a crater. Once the spinning AOSAT I has stabilized (once per few minutes), experiments will be conducted to give a better understanding of what asteroid surfaces are like. “The questions are very basic, and that’s what makes this so much fun,” says Asphaug. When you push slowly on a rock, does it lock into place or does it push aside the other rocks and slide into the surface? Do patterns form when you send a vibration through the regolith? Does cohesion dominate overwhelmingly over gravity, so that rocks stick together into aggregates? What happens when you charge the particles? Despite the small scale of the experiments (the asteroid patch will be slightly smaller than a CD case), Asphaug and Thanga are confident in the real-world applications of AOSAT. “These rocks might not be able to tell the difference, whether they are in the AOSAT centrifuge or back on their home asteroid,” says Asphaug. Once the AOSAT is spun up to mimic the gravity field of a ~300 m asteroid (gravity field 10-5 that of Earth), then it can be used to test mechanisms for asteroid landing. The first AOSAT will use a simple arm that does some basic interactions, while next generation AOSATs will be configured with more advanced robotic equipment. Thanga uses the analogy of a wind tunnel to describe the scientific approach to their experiments. In a wind tunnel, researchers subject small-scale models of aircraft to conditions they expect in flight. The calculations and designs are then scaled up and applied to the real thing. “We can test asteroids in this wind tunnel-like analogous system, prove and disprove theories, and get a better understanding of our models,” says Thanga. Landing on an asteroid may be extremely difficult, but it’s also an extremely desirable goal, from many points of view. Mining asteroids, colonizing asteroids or using asteroids as stepping stones to Mars and the other planets used to be the stuff of science fiction. Now it is on the desk of NASA administrators, who are being asked to find ways to divert hazardous asteroids, and to discover new ways to utilize asteroids, and to involve asteroids as part of the astronaut pathway to Mars. The School of Earth and Space Exploration is an academic unit in ASU's College of Liberal Arts and Sciences.